A continuing gas leak has caused the road to be dug up for a second time in less than a month at the corner of Boscombe Road, Dorchester Road, Clarkes Avenue and Langley Avenue. 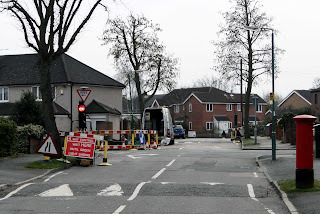 Residents alerted Southern Gas Networks to the strong small of gas in the area and they duly turned up on Monday morning to dig it all up again. Blog readers (and local residents) may remember the entrance to Langley Avenue being closed back in March after a burst gas main required immediate repairs. 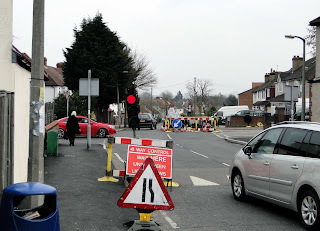 Apparently the council wanted Langley Avenue reopened as quickly as possible so there wasn’t time for lots more poking about under the tarmac. The council is apparently happier with the four way traffic lights, allowing Southern Gas Networks to fix the problem properly. 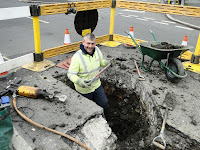 They are hoping to have the leaks all fixed by the end of the week with the road hopefully put back to normal by Wednesday next week. Might be worth avoiding at rush hour in the meanwhile. They're gone! The hole is filled in, the lights gone and the roads are clear. Ahead of schedule!